With Orderhive, you can use FBA (fulfillment by Amazon) warehouse to send orders synced from other channels like eBay, Shopify, etc. or manual orders created in Orderhive. To send orders from Orderhive to Amazon, make sure you've added your FBA account and Amazon MCF is enabled in your Orderhive account. Go to sales order detail page and click on Amazon MCF tab. Now, select Shipping Speed Category. You'll see three categories - Priority, Expedited, and Standard. If you click on Get Rate without selecting one category, Orderhive will show you rates for all categories in a new pop-up. Select your Shipping Speed Category and click on Get Rate. Orderhive will display category-wise rates. You need to select your FBA warehouse from the Warehouse dropdown. Select the ship date, if you want to maintain a record. However, this is not mandatory. Add any remarks that need to be sent to FBA. Now, click on Validate Shipment. If there are errors, Orderhive will prompt you to the correct the same. If everything looks correct, click on Create Shipment. 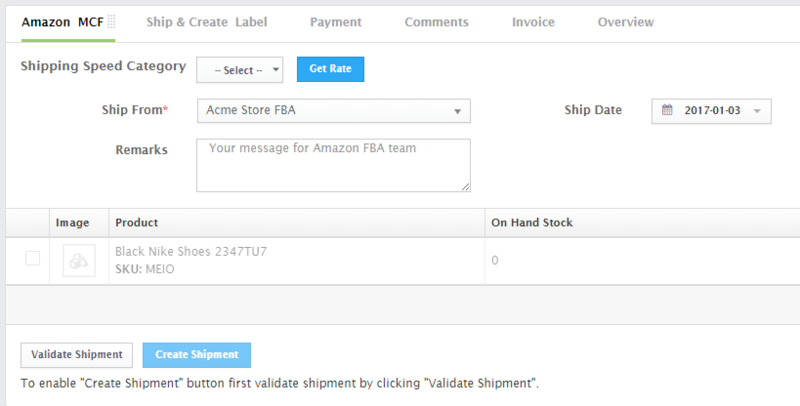 These order details will now get automatically synced to FBA. Once this order is fulfilled by FBA, the shipping information i.e. Courier name and tracking number will get updated in Orderhive and on the channel from where the order was imported. 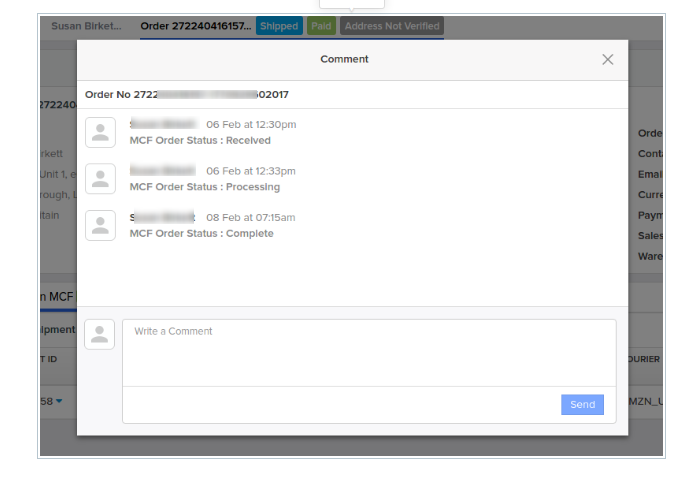 The MCF status will get synced in Orderhive under Order Comments popup.